Choosing the Right Carpets and Rugs– Quality Carpet and Rug Sales from the Industry’s Leading Manufacturers from Pasadena Floors - Serving the Pasadena, MD Area. Carpets and Rugs Experts – Let us help you choose the right carpeting for your home decorating project. 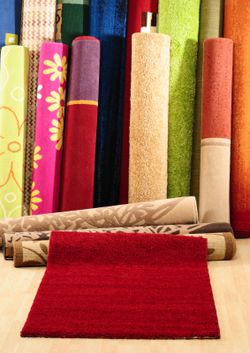 Variety of carpet and rug samples, carpeting colors and styles. - Pasadena Floors, Pasadena, MD. With its nearly unlimited color and texture choices, carpets and rugs offer versatility like no other flooring option. Why choose carpets and rugs? Comfort – Nothing beats the softness of carpet and rug flooring. Durability – Quality carpets and rugs with the right care can last for many years. Variety – With its large selection of colors, textures and patterns, carpeting and area rugs can be tailored to complement any décor. Safety – As a non-slick surface, carpet flooring puts safety first. Noise reduction – Carpets and rugs reduces echoes and noise to lower levels of the home. Material. The most common carpets and rugs are made of nylon. It’s comfortable, durable, and stain resistant. Other options include wool, polyester, and olefin, each with unique characteristics. Color and style: Dark colored carpets and rugs can add intimacy to a room, but they can also show every piece of lint attracted to the floor. Lighter colors can brighten a room, but can also soil easily. From berber to plush, the color and style combinations of soft surface flooring seem endless. Quality: Like most investments for your home, carpet and rugs comes in a variety of grades – and you often get what you pay for. Lower cost rugs may need to be replaced sooner, so the overall investment won’t pay off. Carpet may seem like a simple element in your home – but choosing the right carpeting can be a challenge. The qualified carpeting experts at Pasadena Floors can help you carefully balance your flooring budget against quality and home décor considerations to ensure your carpet and rug selection looks great and can stand the test of time. When it comes time to installing your new carpet, our professional installers will treat your project as their top priority. Pasadena Floors – Proudly serving the Pasadena, MD area since 1994. Call us today at for your free consultation – we look forward to hearing from you!